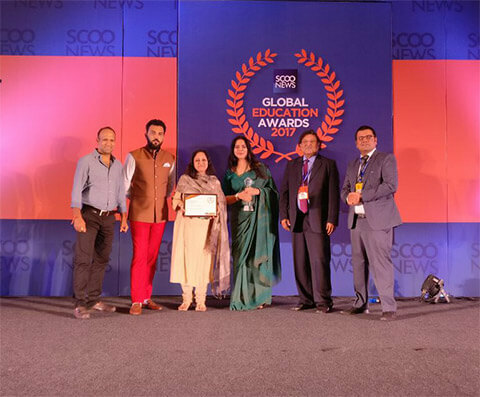 The Sanskaar Valley School added yet another feather to its cap by bagging the Excellence award for the Secondary School of the Year (overall) at the Prestigious Global Educators Fest hosted by Scoo News. The award was received by Ms Lubna Niazi, Head of Middle School and Ms Manpreet Bhan, Head of Junior School at a star studded ceremony held in New Delhi on 19 of August. The event was part of the 2 day long #Unconference 2017 which was a wonderful platform for educationists from all over the world to meet, interact and brainstorm on diverse topics related to education. Some of the eminent speakers were Dr Sugata Mitra, professor educational technology and winner of the 2013 TED prize, the Kung Fu Nuns, Vipul Reddy of Khan Academy, Sonam Wangchuk, founder SECMOL and HIAL Ladakh and Anand Kumar of Super 30 fame. Heads of all major schools of the country were also present to share best practices and discuss the Future of Learning with their counterparts from across the world. Representatives from schools and educational industries in South Africa, America and the Gulf were also a part of this conference. The conference was also attended by Ms Sonia Wadhwa, our IT Manager.